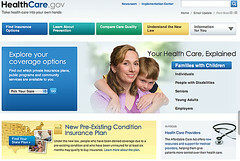 The healthcare.gov website was built by 55 different vendors, and was overseen by the federal government itself. According to testimony to congress, there was no single vendor that was responsible for the overall delivery and quality of the application. None of the people building the various components features were accountable for overall quality. The complexity of even simple software systems is relative not only to the number of lines of code, but also by the number of individual players involved. The lesson here is if everyone is in charge, NO ONE is in charge. When considering outsourcing a project, make sure that you know who’s “throat you can choke” if there are delivery and risk problems, because otherwise you will be left holding the bag. What is referred to as “integration cost/risk” has to be paid at some point in the software project lifecycle. As you bring components together from individual developers or teams, they won’t quite fit. There will be special cases that aren’t handled properly, API calls that drifted from spec to implementation, and unexpected resource contention that will lead to performance problems. The trick is to take that integration cost incrementally throughout the project. Ideally your teams will lock on the integration interfaces early, and then complete implementation in a continuous cycle. It’s also a great idea to prioritize a couple end-to-end scenarios and complete them first so that you can see all the pieces working together as early as possible. If you wait until the end, you will likely spend more time correcting more code because it is built upon poor assumptions. Think of it this way: It’s cheaper to move a wall on a blue-print than once the drywall & electrical is in place. It appears on this project (as in so many others) that end-to-end testing was left to the end and the results of the testing were ignored. The industry best practice (although rarely followed) is to test first. In fact, Test Driven Development says that you should define and write automated tests that express what you expect first, and then code away at the product until the tests pass. It’s easy to underestimate the cost (and the value!) of building a comprehensive automated test suite. Don’t make the same mistake. Think of your specification in terms of tests that pass/fail and you will be able to measure the progress and quality of your application throughout the project. An interesting line of questioning from the healthcare.gov hearings related to if any of the teams raised concerns. In a multi-million dollar government project with dozens of teams, presumably lots of red tape, and no clear leader that no one raised the alarm bells. Don’t think that your software team is immune from this! Under pressure to ship software for a customer or looming launch date, teams may get weary and become short sited in their thinking. “We’ll fix it in the service pack” is an easy excuse. As a software team leader, if you want to know what’s really going on, you need to make bad news not only OK, but actively seek it out. Make sure that raising risks and concerns are rewarded. Don’t play the blame game, but rather look at how the team can make data-driven project management decisions to adjust scope, timelines, and resources for a successful launch. Be honest. Be clear of the technical difficulties. Tell people what you’re doing about it. Vagueness does not build confidence. Your boss or customer may not understand all the technical details, but they will recognize that building, scaling, and running technical systems is complicated. Everyone will want an ETA for a fix. This is the hardest question to handle. The best way I’ve seen this handled is to provide a schedule for when you will give updates on progress, and stick to that religiously. Also providing stats on the current number of issues being worked and what stage those are in helps build confidence as that trends in the right direction. There are many other nuances to handling the PR when you find yourself in this situation but the core principles are simple. Adding more people to a huge project is probably not the right solution. If you set your team up with clear ownership, trust to raise issues, and iterative integration, you probably just need more time. If you need more expertise, bring in the best talent you can and give them full reign with access to the code, people, and documentation you have and let them work their magic. You also want to tightly triage the problems you fix to avoid the unintended consequences associated with additional “churn” in the product code. Also look at what problems can be temporarily fixed with manual reports, processes, or support teams. Depending on the scope of your project, this may be better for you business in the long run as you build confidence with customers and users. Building highly scalable, easy to use, helpful software is never easy. You can increase your chances for success by ensuring clear ownership, integrating & testing early, building trust in your team. And if you find yourself in crisis mode, you have to get up at your “rose garden” and explain clearly what happened and what you’re doing about it. Don’t expect throwing more people & money at the problem to fix it, but sometimes external high-quality help is the only thing that can bring your project back on track. Most importantly, stay positive and focus on making progress on the most important problems. Take a deep breath and remember that at least you aren’t working on the software disaster of the century! This entry was posted in Business Continuity, Disaster Recovery and tagged Barack Obama, HealthCare.gov, Patient Protection and Affordable Care Act, Programming, Project management, Software testing, United States. Bookmark the permalink.